There is no greater mitzvah than honoring those who came before us. Many of Cleveland’s older Jewish cemeteries are located in areas where the Jewish community no longer lives and synagogues no longer exist. 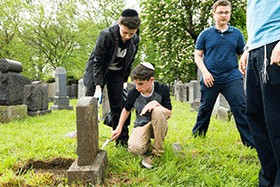 Without an organized effort, these cemeteries have fallen into disrepair and the Jewish Federation of Cleveland has stepped in to help. Over the last year, the Federation has raised $3.1 million for the Cemetery Preservation Campaign, just $400,000 short of the $3.5 million goal to honor the deceased. The Cemetery Preservation Campaign will raise funds to increase the Commission on Cemetery Preservation (COCP) endowment to a level where it will be able to sustain the annual maintenance costs for the cemeteries under its management. This is a community-wide effort. Join us. 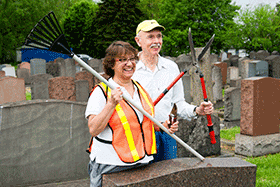 Caring for these cemeteries is one of the highest mitzvot we can achieve. Support for this critical initiative will ensure that we are truly honoring the past, uniting the present, and strengthening the future. In the Cleveland area, there are approximately 69,000 graves in 16 Jewish cemeteries and 3 general cemeteries with Jewish sections. Many are plagued with overgrown trees and grass, broken or missing fences, and overturned headstones. 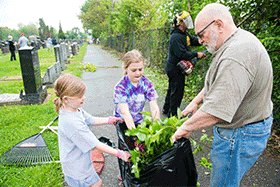 Historically, congregations and benevolent associations have held primary responsibility for the upkeep of their cemeteries; but, not all have the resources needed to carry out their long term responsibility. 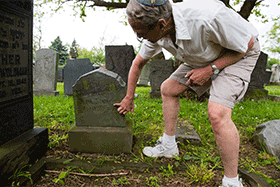 There are 16 Jewish cemeteries in the Cleveland area. There are an additional three cemeteries with Jewish Sections in Cleveland. 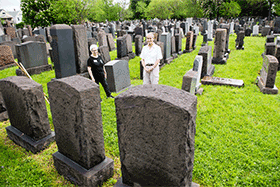 There are over 68,000 Jewish graves in the Cleveland community. 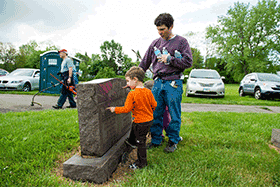 The Commission on Cemetery Preservation (COCP), a supporting foundation of the Jewish Federation of Cleveland, now manages seven Jewish cemeteries. COCP is responsible for the management of over 14,000 total graves. The improvement process has begun with tree removal, stone resetting, and landscaping thanks to the hire of a full-time Cemetery Manager, Brett Cochran, who works with an oversight committee to design and implement appropriate maintenance plans that ensure ongoing care of the cemeteries under the COCP’s jurisdiction. Funds raised by the Cemetery Preservation Campaign will enable the care of these cemeteries in perpetuity and allow for the addition of other cemeteries as needed.